Hi readers, today I will be reviewing another skincare product from Lotus Herbals, I love Lotus Herbals products specially their sunscreens. 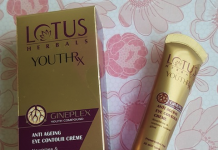 But today I am sharing my views about Lotus Herbals Nutraeye Rejuvenation and Correcting Eye Gel. I am in my late 20s and recently started using eye cream. By god’s grace I don’t have dark circles so far and just have few fine lines. I trust Lotus Herbals completely when it comes to skin care, so I knew that my first eye cream would be from this brand only. 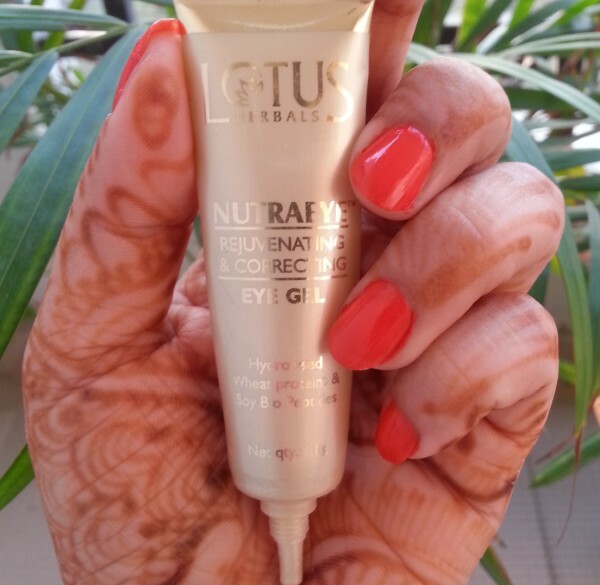 So I goggled for Lotus Nutraeye eye gel and after reading mixed reviews, I decided to give it a try. 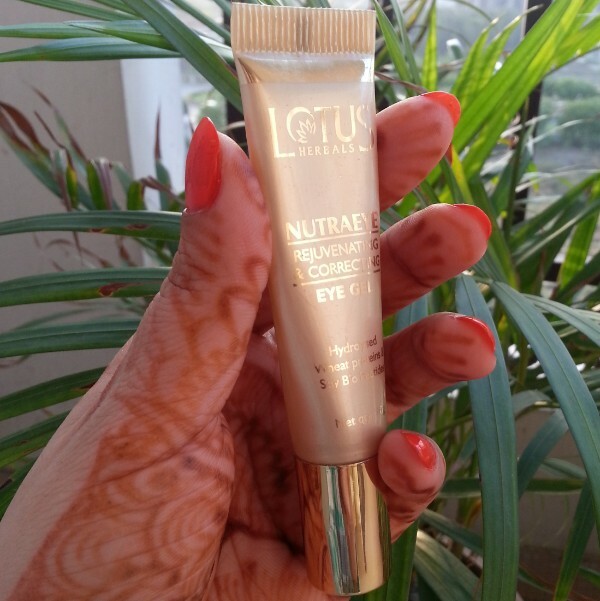 Packaging : Lotus Nutraeye eye gel comes in a luxurious golden squeeze tube with metallic screw cap. The tube is provided with a small nozzle to make sure there is no wastage of product. Overall, the packaging is compact, sturdy and travel friendly. 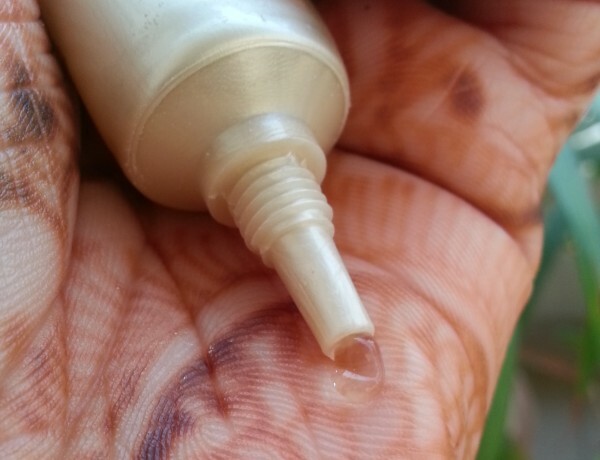 My Experience : This is my first eye cream and I am quite pleased with its results. I have been using this eye gel for last 2 months and now I think I am ready to review it. Nutraeye eye gel has a clear gel like consistency and doesn’t has any fragrance. It is very lightweight and spreads very smoothly onto skin. I generally take an appropriate amount of this eye gel on my finger tip and rub it between both ring fingers and then apply it gentle around my eyes. While massaging, I mainly focus on the outer corners on my eyes to target those crow’s feet. As it is gel based, so for obvious reasons it takes a little more time to get absorbed into the skin. I massage this eye gel with ringer fingers because eye area is very delicate and extra pressure will give rashes or breakouts. I massage it for good 2 minutes, first in clockwise and then in anti-clockwise directions. It gives cooling sensation when applied. Lotus Herbals Nutraeye eye gel doesn’t break me out and it never ever stings on my sensitive eyes. It is enriched with Wheat oil, Rice Bran and Vitamin A & E. It is very hydrating and helps to lighten eye lid pigmentation . A small amount of this cream is required during each use and this 10g tube will last for 30-35 days when used twice in a day. To be honest, initially I didn’t notice any improvement, it is only after a month I notice that my fine lines were less visible. I am using this eye cream religiously twice in a day (early morning and before going to bed) and it reduced the appearance of fine lines up to certain extent (not completely). I don’t have dark circles, so I don’t have anything to say whether it works for dark circles or not. 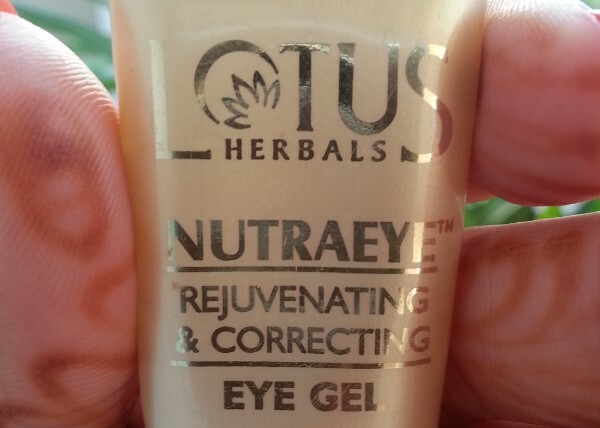 But Lotus Nutraeye is a pretty decent eye gel that will definitely show results, but you need to be patient. 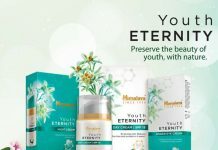 Claim : You will get younger, smoother & softer skin around eyes. Usage : After cleansing, gently dab Lotus NUTRAEYE around the eye area. Massage softly using a light circular motion until NUTRAEYE Gel is absorbed in the orbital eye area. Use regularly every morning & evening for best resluts. THis is actually a good idea! Start from your trusted brand for a new product and work your way upto it! I love lotus herbals. 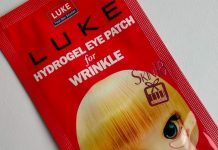 I have been wanting to buy a eye cream will begin with this one!! Hey Vini, Lotus Herbals really offers some amazing stuff. In which age we start use of under eye creams? Im in my early 20s and i have puffy eyes and fine lines which looks very bad! Can you please tellme which cream to use to get rid of them? I dont mind even if its expensive but it should work! 1.Use a cool compress. Wet a clean washcloth with cool water. While sitting up, apply the damp washcloth to the skin under and around your eyes for a few minutes using mild pressure. 2.Get enough sleep at night. For most adults, seven to eight hours a night is a good amount of sleep. 3.Sleep with your head slightly raised. Add an extra pillow or prop up the head of your mattress. Or elevate the entire head of the bed a few inches. This helps prevent fluids from accumulating around your eyes as you sleep. 4.Reduce allergy symptoms. Avoid allergens when possible. Try over-the-counter allergy medications. Talk to your doctor about prevention strategies if you develop under-eye reactions due to hair dyes, soaps, cosmetics or other allergens. I have dark circles under my eyes …Should i try this cream .